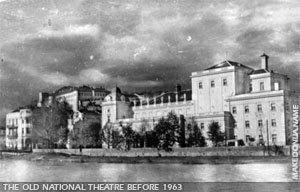 Skopje in the beginning of November 1962, because of several days of torrential rain and unregulated riverbanks, the Vardar river suddenly flooded Skopje and it's surroundings. About 4,500 hectares of land and 5,000 family houses were flooded. Nobody expected that 8 months later another disaster, even bigger and more dangerous, would strike. 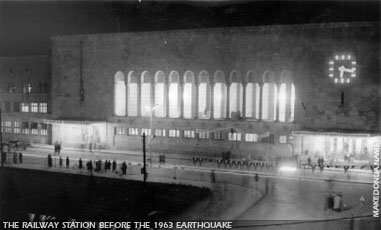 Skopje earthquake - July 26th, 1963. An earthquake unrecorded by more recent chronicles of Skopje, accustomed to peril and suffering. Skopje was leveled, paralyzed, almost wiped from the face of the earth. Only a few seconds were enough to turn 85% of Skopje into ruins. But the greatest damage was the irreparable loss of 1,066 human lives. 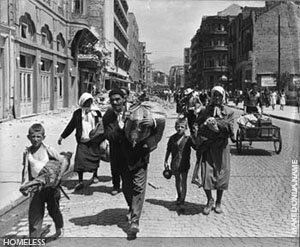 More than 3,300 inhabitants of Skopje were lightly or badly wounded. Only 3 minutes after the first came another earthquake of the same intensity (8.5 degrees of the Mercali scale), followed by hundreds of tremors of smaller intensity. It was that dark Friday, of July 26th, 1963. Clocks stopped with their mechanisms pointing to the fatal 5 o'clock and 17 minutes AM, marking the longest day in the history of Skopje. On that morning seismologists all around the world recorded an earthquake whose epicenter was in Skopje. 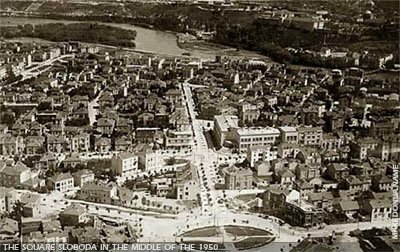 During those moments the inhabitants of Skopje lived through the most terrible experience. Their city was passing through a catastrophe of incomparable proportions. The fury of the elements which mercilessly crashed down with their dance of death destroyed almost everything of value in Skopje, leaving only wounds which needed years to heal. Of the thirty or so monuments that were damaged, Fortress Kale, Suli Ann, Bezisten, the archaeological Museum, the National Bank, cinemas and many buildings, the Army Club (built 1926-1929), the Railway Station and many other completely ruined. 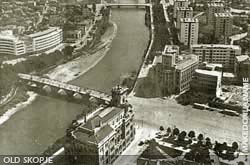 As can bee seen from the picture there is the army Club by the river Vardar, opposite of it, it's the National Bank. 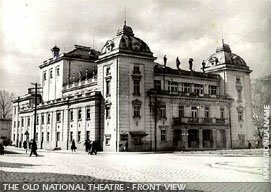 On the north side of Vardar there the National theatre (between the Stone Bridge and the smaller and tiny one). Also on the picture is visible in the left-down corner, the Assembly of Macedonia, that survived the 1963 earthquake. 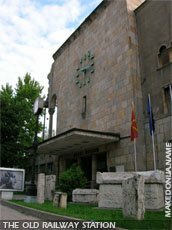 The Old Railway station building was designed and built in the period 1938-1940, by the Serbian architect Gavrilovic. During the 1963 earthquake was partly damaged, and today it's remains are representing a monument of that catastrophe of the city. 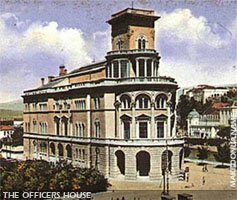 Since 1970 in it, is situated the Museum of the City of Skopje, instituted in 1949. It was adapted into a museum and now it engages 4000 m2; 2500 m2 are planned for the permanent display (in a process of realization) and 800 m2 are used as a gallery for temporary exhibitions. The following annexes function within the Museum: "The Museum of the Old Market of Skopje", The Memorial Museum in vil. 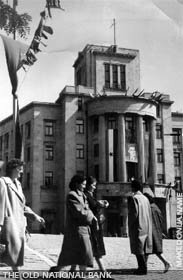 Količani, The Memorial House of the County Committee of the Communistic Party of Yugoslavia for Macedonia and the "Illegal Workshops 1941-45". 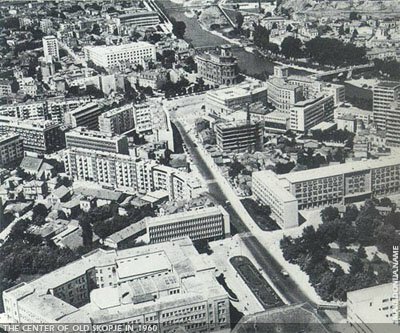 Left: "The Square Sloboda" Right: "The National Bank building, before the 1963 catastrophic earthquake (situated opposite of the army house, in downtown Skopje)"
The Yugoslav National Army was the first to send out a call for help to all Yugoslav centers. That morning several thousands of soldiers began the most difficult but also the most glorious struggle in the peaceful time, a fight against the ruins to save trapped people. Society did not forget these peacetime heroes. 590 of them were later awarded medals from the President of the Republic, Josip Broz - Tito. 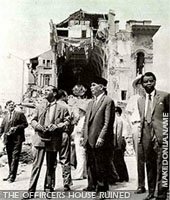 While the earth was still trembling and nobody knew whether another earthquake was to strike, President Tito arrived in the ruined Skopje. Deeply moved by what he saw, Tito said: "Skopje has endured a terrible catastrophe, but Skopje will be rebuilt with the help of the whole society, it will become a symbol of brotherhood and unity, of Yugoslav and world-wide solidarity". These words, pronounced on July 27th, 1963, came true. It is enough to spend only on day in the city on the Vardar to see that is so. New about the earthquake was released through the ether very quickly. On that very same day the sky over Skopje was too small to accept all the aircrafts bringing aid. In those first moments about 80 countries sent help to the city of Skopje, which thus really became a symbol of Yugoslav and world-wide solidarity.